Italian pesto is traditionally made with lots of parmesan cheese. This new pesto recipe tastes like the Italian version everyone loves, but it's vegan and Paleo-friendly! Place the zucchini in the food processor fitted with an S-blade and process until smooth. Add basil, olive oil, nutritional yeast, garlic, and salt and pulse a few times to coarsely chop the basil. Add the pine nuts and process until the texture is creamy, with crunchy, bits of pine nut throughout. Do not over-process or the pesto will become too oily. 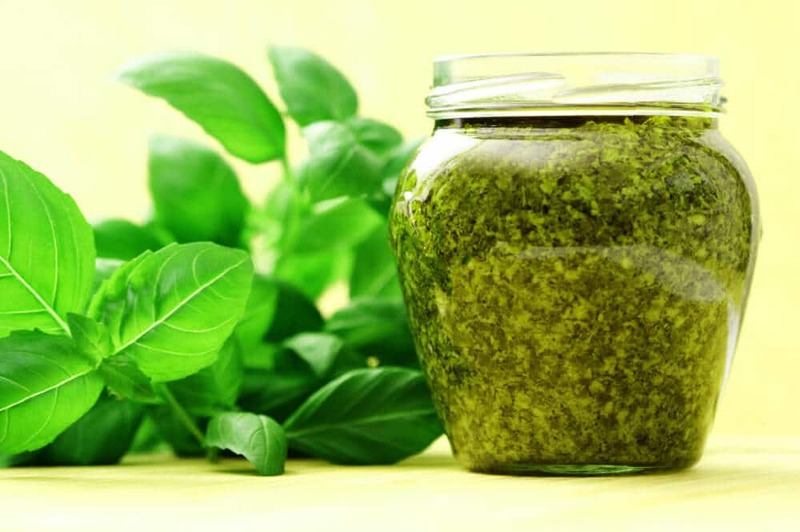 Stored in a sealed glass jar in the refrigerator, your pesto will keep for about 5 days. Alternatively, pour the sauce into ice cube trays, and once frozen, transfer the single serving pesto cubes to an airtight container in the freezer. Stored in the freezer, you can enjoy fresh Italian pesto goodness all winter long. Hand chopping with a mezzaluna is the traditional, Italian way of making pesto, and it only takes about 20 minutes. By chopping all the ingredients by hand and not blending them, you avoid the ingredients becoming a completely homogenized emulsion or paste. When you serve a pesto that has been hand chopped, you get definition between ingredients, and bright flavors pop in a way they don't when they've been blended into one. Using a mezzaluna or sharpened chef's knife, start chopping the zucchini until minced. Add garlic to the zucchini chopping, along with about 1/3 of the basil leaves. Once this is loosely chopped, add more basil, chop some more, add the rest of the basil, chop some more. Scrape and chop, gather and chop. At this point the zucchini, basil and garlic should be a very fine mince. Add the yeast and about half the pine nuts, chop. Add the rest of the pine nuts, chop. In the end you want a chop so fine that you can press all the ingredients into a basil "cake." Transfer the pesto "cake" to a small bowl (not much bigger than the cake). Cover with the olive oil. Gently stir the olive oil into the pesto before serving or freezing. Store according to the Quick and Easy Method. This is a wonderful pesto recipe. I’ve featured it in my post 10 Best Raw Vegan Pesto Recipes in Greenthickies.com. I’ve only shared a small snippet, one image and all credits given to you and links back to this page. Hope it is okay with you? Perfectly, OK! That’s how it’s done! Thanks so much for sharing, and I’m really glad you enjoyed it! Quick question… I don’t have a food processor, but do you think a blender would work? Thinking about trying it this weekend. Pesto party: what a great idea!! Your site is my new favorite. I’m allergic to wheat/gluten, grains, corn, soy, and dairy, whew, a long list that elicits wide open eyes and gasps from any restaurant/store employee. I’m commenting today with the hope you will include a link for the nutritional yeast flakes and explain what they are. My best friend is an accomplished chef and has talked to me about yeast, but for some reason I still don’t get it and it scares me. I avoid anything with nutritional yeast listed. Aw shucks! So glad you are here! Nutritional yeast–sometimes called “nooch”–is a de-activated (dead) yeast called Saccharomyces cerevisiae. It is not the same as active dry yeast for baking bread or brewer’s yeast for making beer. It is in no way related to Candida albicans (human yeast). Nutritional yeast is gluten free, and often spray-fortified with Vitamin B-12, iron and other vitamins to make it a useful supplement for vegans, but the yeast does not actually contain any B-12 naturally. Nutritional yeast provides complete protein, and lends a salty, nutty, cheesy flavor to whatever you add it to. Nutritional yeast products do not have any added monosodium glutamate; however, all inactive yeast contains a certain amount of free glutamic acid because when the yeast cells are killed, the protein that comprises the cell walls begins to degrade, breaking down into the amino acids that originally formed it. Glutamic acid is a naturally occurring amino acid (protein) in all yeast cells, as well as in many vegetables, fungi and meats. Thanks that is one of my big questions also. I also came across something tonight regarding lactic acid. As the Smart Balance container states on the box Dairy Free and 100% dairy-free ingredients, how can one ingredient be lactic acid? I have had to start a dairy free and gluten free diet. I am reading alot of ingredients.. Yesterday I cooked something with this product and ate it. I Developed a problem that I can not account for. I am wondering if this could account for the problem. Lactic acid is a natural byproduct of the fermentation of any food, not just dairy. The lactic acid in Smart Balance is probably from a vegetable source, since it is a vegan product. That doesn’t mean you won’t be sensitive to the ingredients in Smart Balance however, even if they don’t contain dairy. Rebecca, I am also allergic to gluten, dairy, soy and many other things. Although I have followed a vegan diet in the past, I do eat animal products such as my own organic fed, free-range chickens and their eggs, wild caught fish and very rarely grass fed beef. I do however still enjoy many foods I became acquainted with through my vegan days. Nutritional yeast is one such food. It adds such great flavor to so many dishes! When it becomes difficult to go to restaurant and find food that won’t cause you problems, it makes more sense to become a great cook at home. Try nutritional yeast… you’ll likely use it regularly.